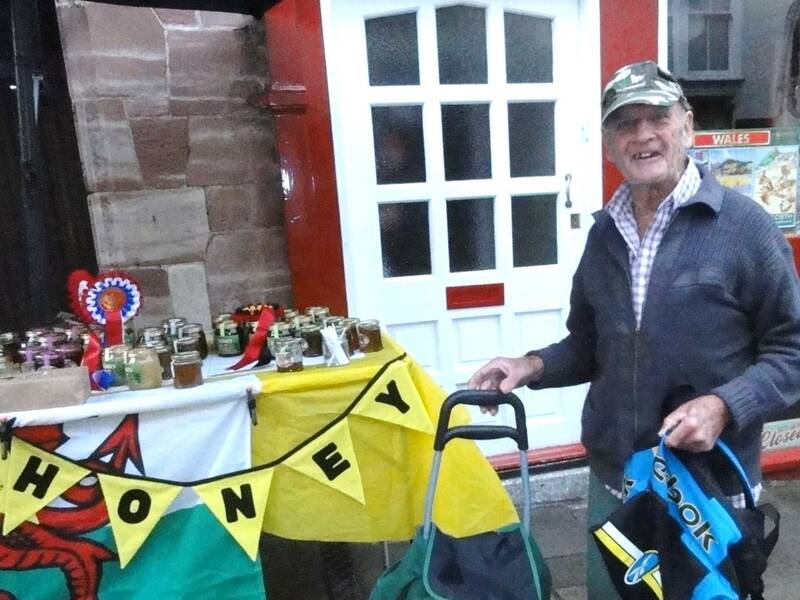 This picture from Barry Griffiths shows Bill from Caernarfon at the 2015 Conwy Honey Fair, with his honey trolley. Bill has been coming to the Fair for a great many years, often wearing shorts in quite cold weather. He buys a jar of honey from every stall. That’s nearly 30 stalls in a good honey year like 2014. He has told us that he saves all his 50p coins to buy honey. He says that he eats a jar of honey every week. One year he came to the Fair with a builder’s wheelbarrow and a blanket to protect the jars. He always brings back a large carrier bag full of empty jars. We love to see him at the Fair, and we hope he continues to visit Conwy for many years to come. Message from Cathy Gee…The Honey Fair was the highlight of our year when we were teenagers! Welsh honey, no 8 rock and being allowed to go to Conwy on the bus without our parents! Happy days! Message from Peter McFadden, Honey Fair Organizer…The 2016 Honey Fair was the last Conwy Fair attended by Colin Jones, who died in December 2016. Colin was a Conwy Jackdaw (a person born within the town walls) and he lived within the town walls all his life, first in Rosehill Street, where his mother ran a guest house, and later in Uppergate Street. I worked with him and his daughter Jackie for many years, at the Hotpoint washing machine factory in Llandudno Junction. I recall Colin saying to me at one of the Fairs that Edward 1st would be proud of me. What a lovely comment! Twice a year, Honey Fair and Seed Fair. Used to love it. My mum would by her China from the China stall. She always bought Pwllheli no 8 rock and we’d try to get free samples. If it was a school day we’d rush home, change of out of uniform as fast as possible and rush down there. All the kids would have water pistols. It used to go on into the evening too. We’d like to hear your tales from the Honey Fair!